After yesterday’s Guns vs Sports vs Wars I wanted to test news by location: local, for news related to the city or region where the newspaper is published; national for US news; and continent (as Ethan suggested). 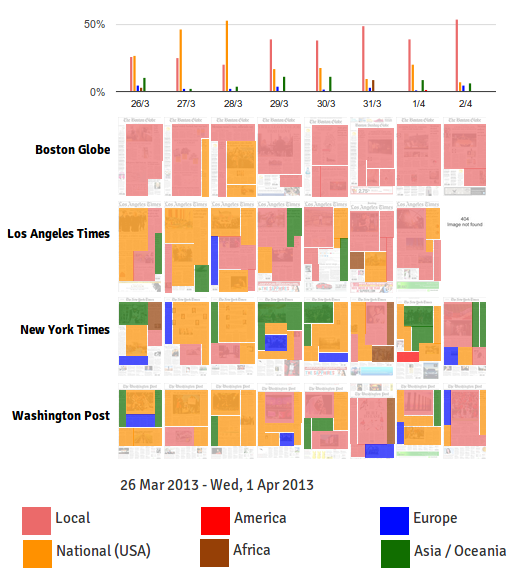 This visualizations fits pretty well with the previous one, as it fills the gaps of the more locally oriented newspapers like The Boston Globe and LA Times. Note: I have only coded the main news (the ones with bigger size).